September 23, 2016 by Emily Brees 8 Comments - This post may contain affiliate links. 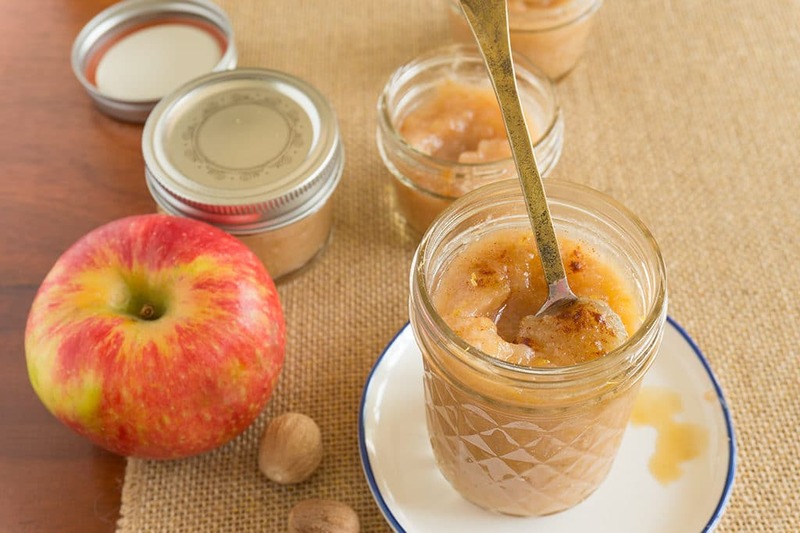 Maple Apple Sauce is a fall tradition. Served warm it’s super cozy on chilly fall nights. Freeze into small portions + use as an oil replacement for your baked goods! Maple Your Apple Sauce. 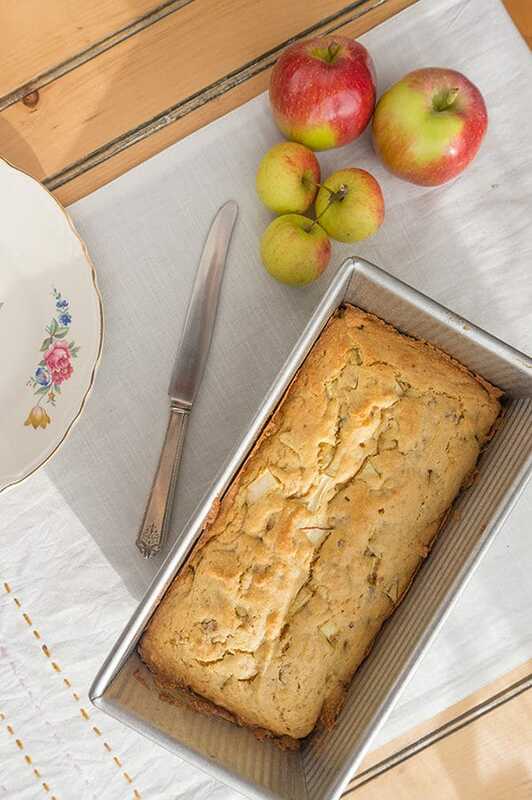 That’s right, it’s apple season and we’re picking and saucing and doing all sorts of apple bread baking. If you’ve followed Oat&Sesame’s #travelingandeating posts, you know that every year I take an apple roadtrip. This year is no different. I’ve been busy planning what direction I’ll head and after much deliberation decided to head straight north from Albany to Lake Placid. There is some amazing hiking and camping in this region and that’s where I’ll be gathering up all the apples I can find. We need plenty of apple energy to hike the 13.5 miles RT to Mt. Marcy– the tallest mountain in New York! Stay tuned for trip photos and apple themed recipes! The only tool I highly recommend is a food mill (above). It looks like a medieval contraption, but it’s really an invaluable kitchen tool – especially for any fruit or vegetable you want to puree. 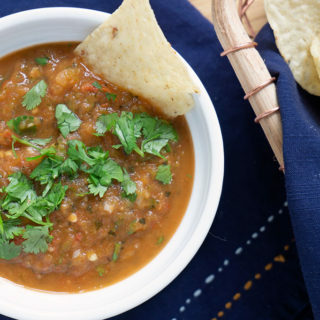 Think fresh pumpkin, tomato sauce, baby food and of course applesauce. 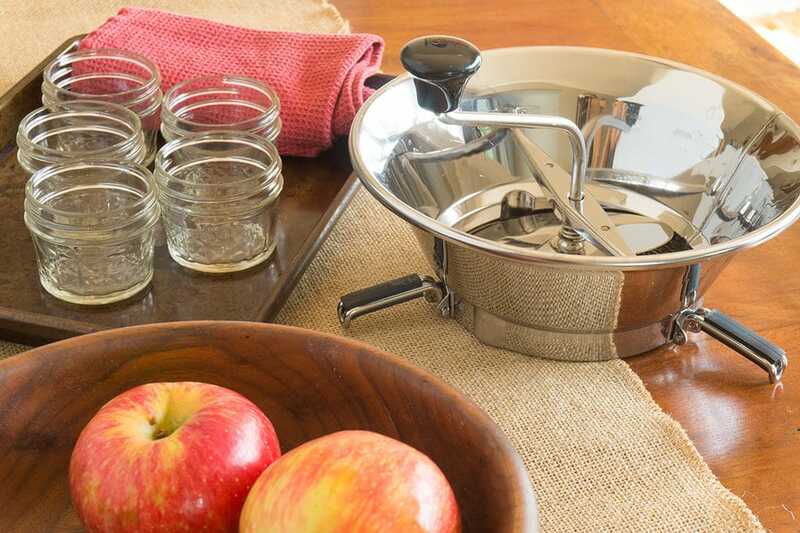 Using a food mill means you don’t have to peel, de-seed or de-stem the apples. Just quarter them, place in a large stockpot and cook them down. 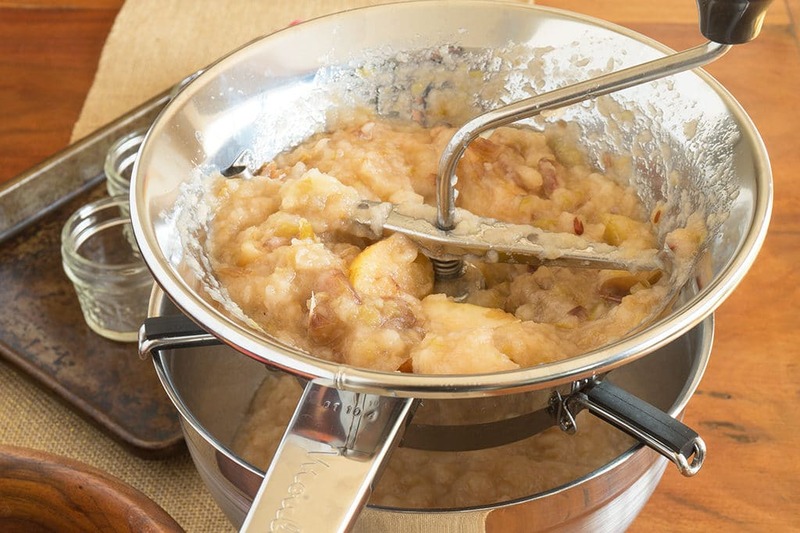 The food mill will strain any tough pieces out and the seeds, skin and stem give homemade apple sauce an extra flavor bump. For storage, you can either freeze applesauce or jar it. I freeze it into 1 or 2 cup portions which makes it very easy to measure when I need to use it for baking or just take a little out for snacking. Who doesn’t love a bowl of warm applesauce sprinkled with cinnamon on a cold, blustery winter day. These days are coming people and I’ll have my apple sauce ready! Doesn’t this just look warm and cozy? 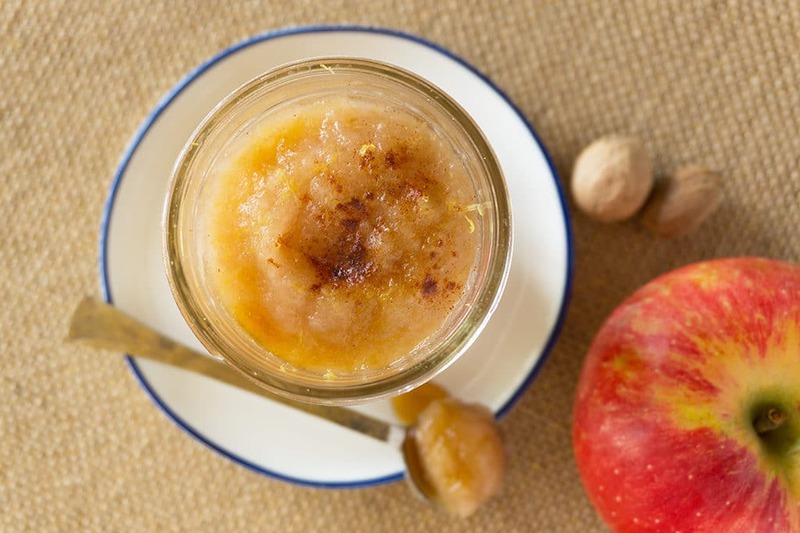 Jarring applesauce is super simple. It may seems a bit nerve-wracking if you’ve never done it, but if I can do it, you definitely can too. I use the oven method – described in my jam recipe post (10 min, 350F). Fill the sanitized jars with applesauce while the jars are still warm. Leave about an inch of headroom at the top for expansion and to create the air vacuum which will self-seal the jars as they cool. Screw on lids and let them sit at room temp to cool. Congrats, you’re a jarring pro! Imagine what you will do next! 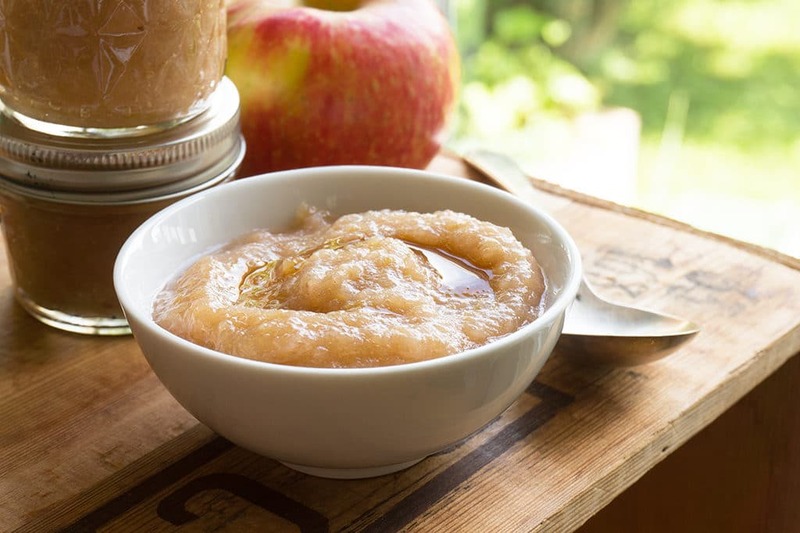 Fall apple sauce using several apple varieties swirled with maple syrup and lemon. 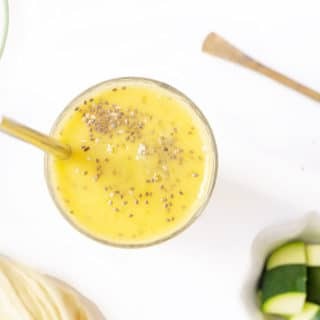 Make batches to get you through til next season! Cut apples in to quarters. At the same time, you should sterilize your jars - 350F in the oven for 10 min on a baking sheet, glass part only. Or skip if you plan to eat or freeze the applesauce within the next week. Increase heat to medium and cook uncovered for 10 minutes to reduce liquid. Put apples through a food mill, discarding peel and seed as you go. If you will use the applesauce for baking, store as is, unsweetened. If you would like to have this as a snacking applesauce, add maple syrup, lemon zest, cinnamon, nutmeg and salt. Mix well. Spoon into hot sterilized mason jars leaving about 1" headspace, seal with lids. Let cool. Lids should pop inward making a little ping sound when completely cool to indicate they are sealed. *Cinnamon sticks can be reused! Rinse it and save it for the next round of apple sauce! Last year I made lots of healthy apple treats & some DELICIOUS roasted butternut squash and apple tacos. Check out my Apple Harvest Pinterest board! 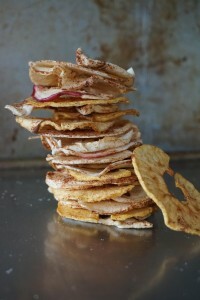 Follow Oat&Sesame’s Apple Board on Pinterest. 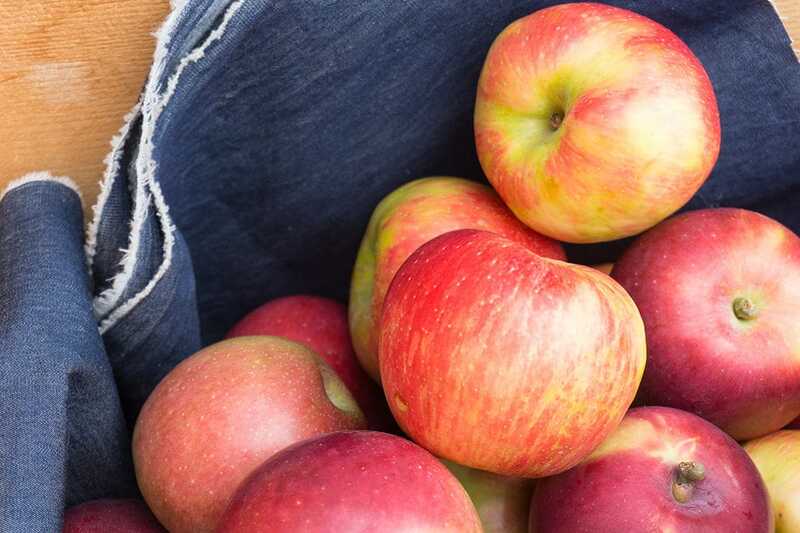 We love apple picking each fall, but ALWAYS pick too many apples! 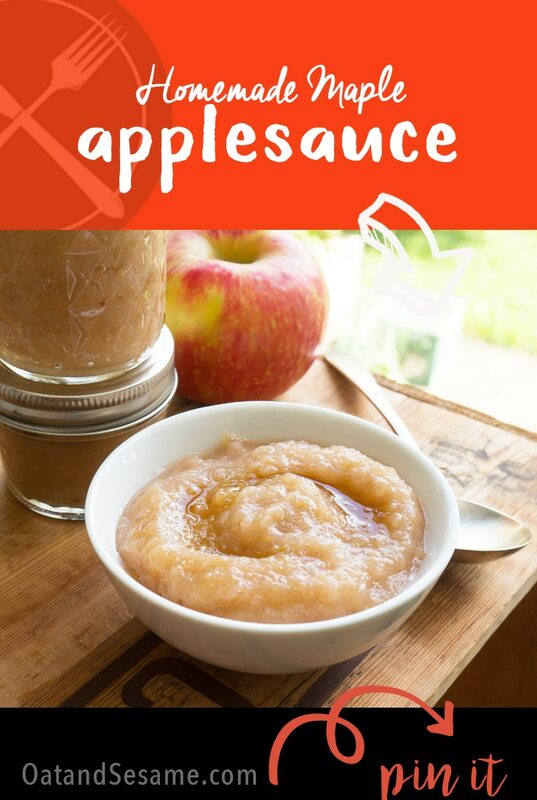 After baking and freezing like mad and munching on apples for weeks, applesauce is just the thing for using up what is left! I am going to try your maple version this year. The flavor combination sounds wonderful! I know! I always pick way too many! There are so many varieties to try! I’ve never made my own apple sauce but maybe I should! 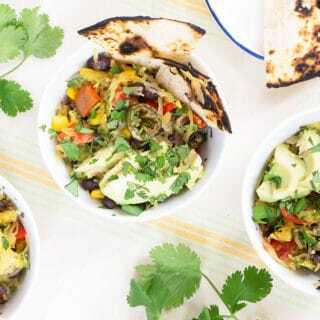 Would love to have you join our meatless Monday link up too. Awesome! I’d love to join in there too! I’ll check it out! You won’t be disappointed! We’ve been eating applesauce over here like it’s ice cream! Enjoy it! I made this for Thanksgiving and my family loved it! I was curious, though, where the cinnamon stick comes in? I’ve read it through a few times and can’t see that step. Thanks. Hi Carrie! I’m so happy your family loved it! The cinnamon stick goes in the pot with the quartered apples and simmers with them while they cook down and then is removed after the apples are done cooking. I forgot to put that in the directions. I will add it now. Sorry for that omission and thank you for letting me know!